Isn't this little girl's room inspiring?! It just puts me in the decorating mood. Not that it takes much to motivate me in that department, but I'm just in love with this space! 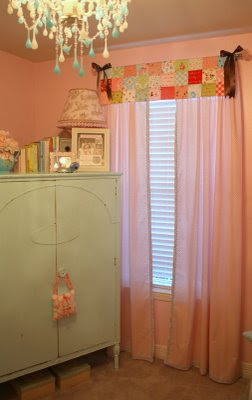 I love that chandelier, the vintage pieces, and color choices - such as the blue used on the armoire, against the pink. Great combo! There isn't anything I don't like about this space. I found it on little pumpkin grace - so check it out for more inspiration, and to see photos of the adorable bedroom occupant! Love the chandelier! My friend Laura and her husband, John just bought an old house in downtown Lexington that came with 2 chandeliers! She said they're worth about $1,500 a piece as they're antiques. Once they get settled, I'll work on her to send some pictures. She has great decorating taste! 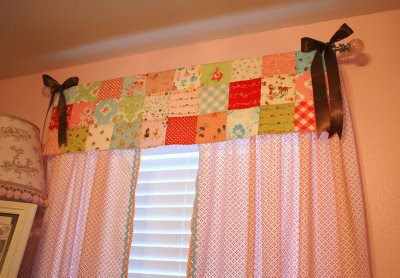 I just came over from so pickin cute's original blog location, and am pleasantly surprised by this cute piece. Looks amazing. Esther! That would be sooo great. I think I know who you're talking about, and I would LOVE to have pix. I'm still waiting to see that dining room of yours! ;) Oh, and I haven't seen your completed bedroom either! Nicolette, I'm so glad you came over! :) Don't you LOVE this bedroom?! Adorable!!! I love the cabinets and the monogram by the bed. Such great inspiration! I became a follower so I can see your ideas and such. I just started a second blog. check it out! Such a sweet space :) I absolutely lov eht echandelier, the armoire, & all the little accessories. I LURVE that chandy!! When we first moved in I was on the hunt for a similar one after seeing another that was black & turquoise featured in Southern Accents. I never could find one or find the turquoise drops to DIY one. So pretty in this lucky little girl's room!